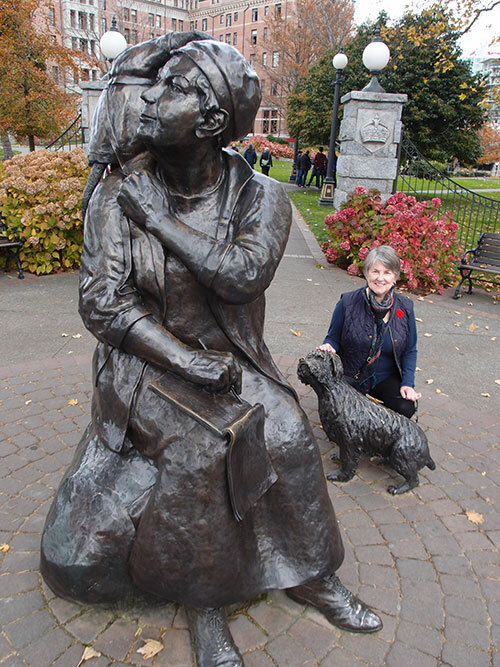 On the morning of our third full day in British Columbia, my husband Ralph and I departed for Victoria, the place of Emily Carr’s birth in 1871 and the city where she spent most of her life. We boarded a bus in front of our hotel in downtown Vancouver and rode to the Tsawwassen ferry terminal, where the bus drove right onto the first deck of the BC Connector ferry, parked and let us out. On the top deck we discovered a glassed-in buffet restaurant; on this rainy day a perfect place to observe the landscapes of sea, sky, and forest that Emily Carr loved as we sailed across the Strait of Georgia. A few hours later, at the entrance to the Victoria’s Empress Hotel (where Emily often endured ‘high tea’ with her parents and four sisters), Emily herself greeted us, or so it seemed, sketch pad in hand. Emily’s Javanese monkey ‘Woo’ perches on her shoulder. Her beloved purebred Bobtail sheepdog ‘Billie’ stands nearby. 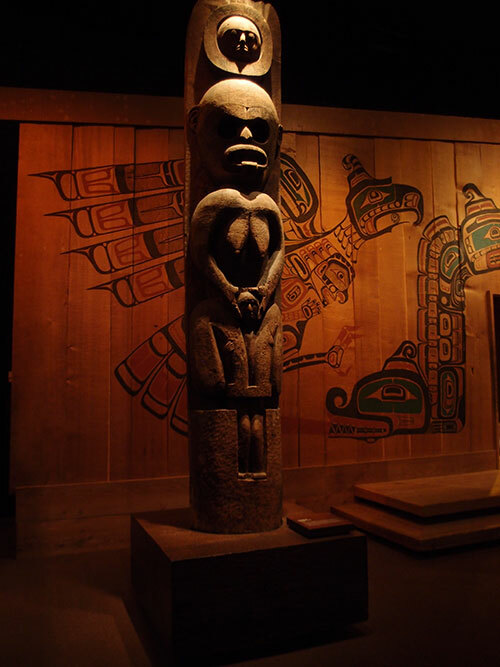 Cast in bronze, the commissioned statue is a masterful rendering of this visionary artist who captured the coastal forest landscape, generally around her Victoria home, in a way previously unseen in British Columbian art. 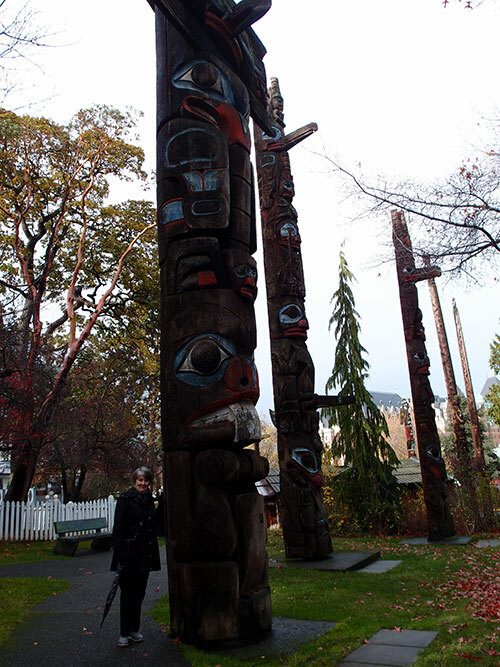 Over the next three days, Ralph and I walked the paths Emily once walked: along the Victoria waterfront, through Beacon Hill Park where wild peacocks roam, past Parliament buildings, and totem poles and First Nations monuments in Thunderbird Park. 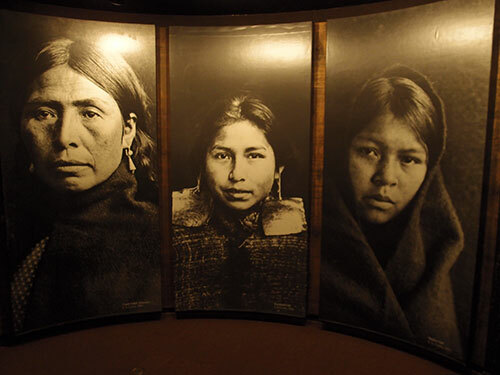 While viewing the First Nations collection in the Royal British Columbia Museum we came face-to-face with two and three-dimensional representations of the history, art, and culture of the people to whom Emily Carr paid homage in her paintings and writings. 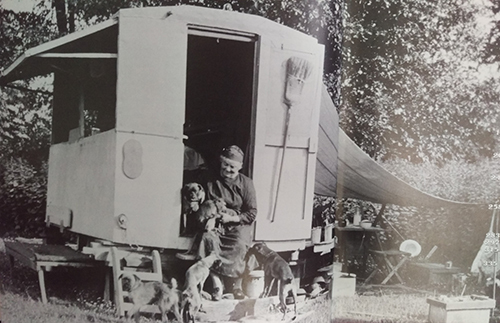 According to biographer Maria Tippet, in these deserted villages Carr was able to experience the wholeness that she sought all her life: everything was part of everything else. 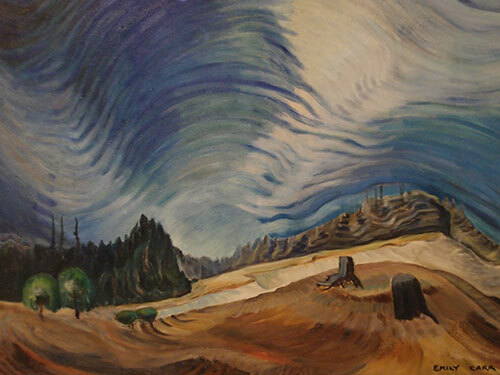 Picturing the Giants: The Changing Landscapes of Emily Carr was the name of the major exhibition of Emily Carr’s work at the Art Gallery of Greater Victoria. Carr was an early and ardent environmentalist who championed the preservation of old-growth forests she portrayed in her work. Among her most famous is Above the Gravel Pit. While in Victoria, I was reminded that Carr had years of formal art training in British Columbia, San Francisco, London, and Paris. She began her artistic career as an art teacher. She converted the barn at her family home into an art studio in 1894 where she taught art to children. 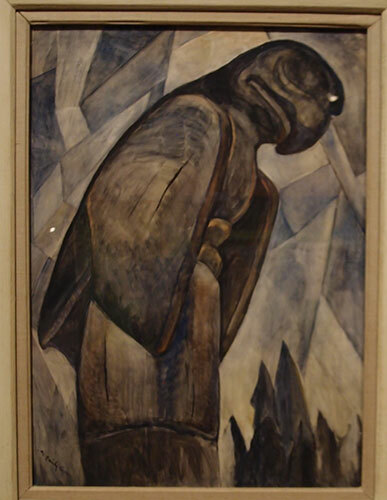 Later, in 1906, she moved to Vancouver to start a job as an art teacher at the Vancouver Studio Club and School of Art, but left to open her own studio and to teach children’s art classes. Carr dabbled in a variety of styles prevalent in the early 20th century, such as Post-Impressionism, Fauvism, Cubism, and Expressionism. She was not, by any means, a self-taught child prodigy. And then, from time to time I think about how incredibly interesting it would have been to travel with her.